Reliance are proud to unveil their newly refurbished Tool Room which now incorporates the Apprentice Training Area. Originally two separate rooms, the decision was made to enhance both areas and combine them as part of an ongoing programme of investment to upgrade the manufacturing facility. As well as making tooling for the machines in production, the Tool Room has always been a key training area for Reliance’s Apprentices. By incorporating the Apprentice Training Area, a dedicated space for first year Apprentices, the two departments have an even greater opportunity to work together. 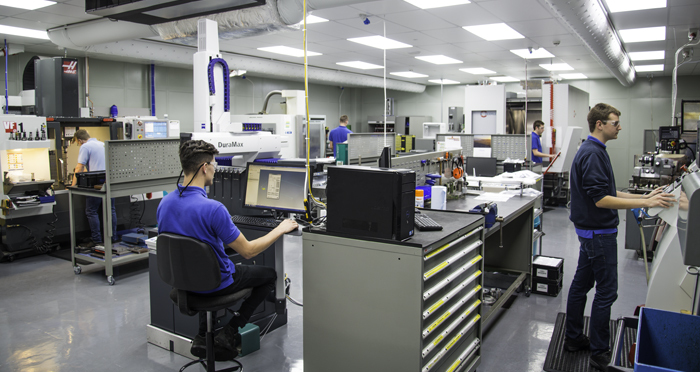 Typically Apprentices learn their core engineering skills on traditional manual machines, but with this new open-plan working environment the Apprentices have more interaction with CNC machines at a much earlier stage. Working alongside the Tool Room team they become more knowledgeable about tooling much more quickly, benefitting their move into production further into their Apprenticeship. The unveiling of the new room has received a positive response from the team. Communication is stronger and the Apprentices acknowledge the benefits they gain from undertaking tasks that are contributing to the actual production process. The new integrated Tool Room and Apprentice Training Area is part of a dedicated investment programme by Reliance. Aiming to create a world-class training facility, Reliance has invested close to half a million pounds in this area in the last twelve months. The latest addition, a Hermle five-axis milling machine will join a range of machines to mirror those used on the production floor, enabling the Apprentices to learn the necessary skills required to operate them.